1958, Royal Academy Summer Exhibition, no.612. By the late 1920s, however, Newton’s career was on the rise. He drew inspiration for his painted views of the city when wandering around London, often in areas on the fringe of prosperity such as Bayswater, Paddington, and the industrial tracts along Regent’s Canal. He was termed ‘the Regent’s Canaletto’ by critics for his atmospheric scenes of London’s waterways, decaying warehouses and dilapidated Regency townhouses reflected in watery surfaces. Usually deserted, these townscapes possess a certain uncanny eeriness. Unpeopled streets evoke the legacy of WWI: a generation of men sent to France, never to return. Like other artists who lived through the war, such as Paul Nash, Newton’s scenes are haunted by the ghosts of his comrades; absence speaks to loss, drawing attention to what should be present but for a profound tragedy. Throughout the 1930s and beyond, Newton enjoyed increasing success and his work commanded correspondingly escalating prices, as his paintings were in demand with wealthy and noble families. He was commissioned by these collectors to paint ‘portraits’ of their country houses. From the 1950s onwards his landscapes took on greater prominence in his oeuvre, and were all he produced from 1954 until his death in 1968. Newton was elected an Academician in 1943 and a posthumous retrospective of his work was held at the Royal Academy in 1980. His work can be found in international public collections including the Tate, the Victoria & Albert Museum, the National Gallery of Victoria, the National Gallery of New South Wales, Sydney, and the Metropolitan Museum of Art. ‘On the Kentish Downs’, c. 1960, is a quintessentially mature work by Newton, looking over the rolling countryside of the ‘Garden of England’. The predominant focus of Newton’s scene is the quality of light, the ever paradoxical search to capture ephemeral and elusive atmospheric effects in painted form. The luminous quality of the surface is achieved through built up thin layers of glazes of oil paint. The landscape is seen in the hazy glow of late afternoon or evening sunshine, long shadows cast horizontally across the gentle central dip. In the face of turmoil and trauma, political and personal, the rural idyll of the English countryside stands as a foil, an unchanging beacon of consistency and a haven of peace. Nonetheless, even amidst this tranquil scene, allegorical elements, in the tradition of seventeenth-century Dutch landscape paintings, suggest discord and an uncanny sense of menace. 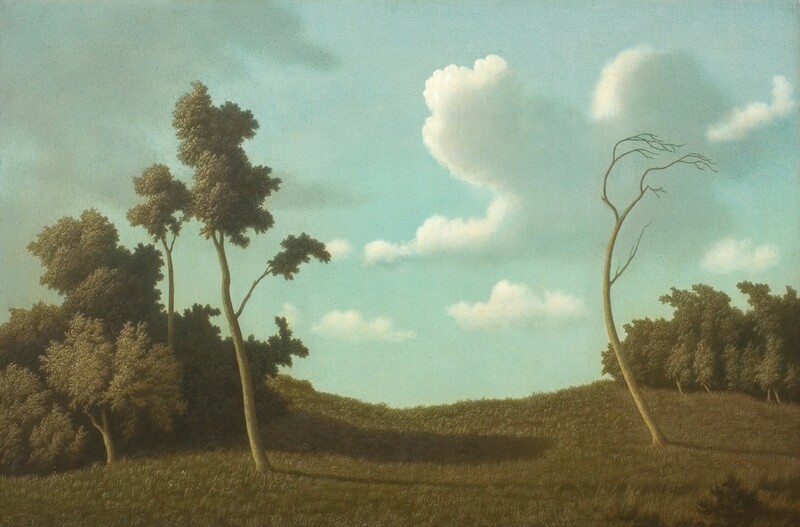 A pair of statuesque trees frame the composition to the left and right, with the woods in the background casting a shadow over the grassy trough between the trees. The tree to the right is stripped of its foliage, its trunk and branches reduced to raw bark in stark contrast to its leafy partnering tree and the dense woods behind. Scudding grey clouds to the left suggest the balmy weather may be broken by incoming rain. The landscape bears immanent potential: life forces reside within arcadia. Concerns of life and death, of transience and permanence, of repressed trauma are all just beneath the surface of ‘On the Kentish Downs’.